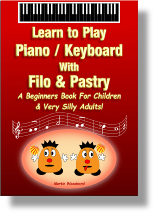 This is easy Piano / keyboard tuition book completed August 2013 and is aimed at absolute beginners, particularly children or adults with a sense of humour. This book starts at the very beginning and assumes no musical knowledge and progresses at a slower rate than my other piano / keyboard instructional books. This book is both informative, funny and very easy to read with many diagrams and pictures. In all about 70 A4 pages of knowledge and fun! A Beginners Book For Children & Very Silly Adults!